Jessica Jones (2015), Season 2, TV-MA, 13 Episodes - The second season of Jessica Jones has been out on Netflix for about a week and a half now as it was released a day earlier than usual to coincide with International Women's Day on March 8. I wasn't sure what to expect from season 2 as her comic book history is relatively limited when compared to her Defenders teammates (she first appeared in 2001) and her primary villain (Kilgrave) had already been dealt with in the first season. What I got was a well paced, deeper exploration into Jessica's past that also provided significant character development for a number of characters (one of which hit very close to home for me personally, which I will discuss more in the spoiler section). Season 2 takes place shortly after the events of The Defenders series. Jessica (Krysten Ritter) is trying to go about her business running Alias Investigations with the help of her neighbor Malcolm (Eka Darville), but she finds it increasingly difficult to avoid clients who want to hire her because of her powers. On top of clients trying to hire her as muscle, she finds herself dealing with a new apartment super - Oscar (J.R. Ramirez) - who is adding to life's difficulties and a man she perceives to be a paranoid whack-job - Robert Coleman (Jay Klaitz) - who claims to be hunted because he had been a part of medical experimentation (he refers to himself as The Whizzer and becomes super fast when he feels nervous or threatened). Trish's (Rachael Taylor) talk radio show is beginning to lose momentum after drastically increasing in popularity as she covered powers-related topics stemming from the events of season 1 and The Defenders. She pushes Jessica to try and dig into her past in search of some closure, but Jessica only wants to repress those memories and move on. We also see more layers of Trish's dysfunctional relationship with her mother Dorothy (Rebecca De Mornay). Jeri Hogarth (Carrie-Anne Moss) is diagnosed with a debilitating disease, and finds herself in an emotional tailspin while at the same time trying to find her way back into Jessica's good graces after her attempts to send Pryce Cheng (Terry Chen) - another P.I. - to acquire Jessica's services goes wrong. All of these plot threads create a perfect storm that causes Jessica to jump down the rabbit hole that is her past, where she finds a lot more personal baggage than even she expected. Krysten Ritter, Eka Darville, and Rachael Taylor continue their wonderful portrayals, and J.R. Ramirez is a nice addition to the supporting cast, but this season really belongs to Carrie-Ann Moss. Her portrayal of Jeri's trials and tribulations stemming from her diagnosis is nothing short of amazing and it really humanizes her character. The villainy for this season is actually provided by a couple of characters: Dr. Karl Malus (Callum Keith Rennie) and Alisa (Janet McTeer) - who both have direct ties to Jessica's past. We saw in the trailer that David Tennant's Kilgrave makes a return, but have no fear, they didn't try and do some crazy 'back from the dead' bit with him. His appearance is done quite well and provides some nice connective tissue to the first season. As I mentioned earlier, I wasn't sure what to expect from this season. There weren't really any hints of what direction they may go based upon Jessica's comic book history. What we got was a logical continuation from the events of the first season and The Defenders based upon Jessica's general outlook and attitude that provided great character development no only for her, but for the majority of her supporting cast as well. While season 2 leaves in a similar position - not really knowing what to expect next - I really enjoyed it and am very much looking forward to seeing where they go from here. - First I'd like to discuss Jeri's diagnosis. I kept it vague in the actual review because I know it blindsided me and I didn't want to spoil the potential impact of that for anyone else. The way it is set up, I (and likely most others) assumed that they were going the way of Cancer. When it was revealed that she had been diagnosed with ALS (Amyotrophic lateral sclerosis), I literally gasped out loud. Those close too me and my family know that my uncle passed away about two years ago after battling ALS for years. It is an absolutely devastating neurological disease. I won't get on a soap box here, but if you want to learn more you can do so by visiting the ALS Association's webpage. So yeah, this development hit extremely close to home for me and for the most part I was pretty pleased with the way it was handled. I was really afraid that they were going to 'magic' it away somehow, and as that possibility was explored I felt like that would be a cheap, easy 'out'. Instead, they ended up having Jeri be scammed, which shocked her back into wanting to fight and accomplish as much as she could in the time she had left. The life expectancy of an ALS patient after diagnosis usually averages between two and three years, but can vary drastically (which was mentioned in the show). As an example, my uncle lived about ten years after being diagnosed and Stephen Hawking, who passed away just this past week, lived with ALS for fifty five years. Unfortunately, those examples are outliers in the grand scheme of things. Anyway, I'll reserve judgement until we see how this development is handled in future appearances, but I do feel as though it has handled in a respectful manner so far. - All of season 2's episodes were directed by women, a theme that was announced months ago, but is also a nice little tie-in with the International Women's Day release. - I also didn't want to discuss Alisa's actual identity in the main review as I wanted to avoid spoilers. I really liked that she turned out to be Jessica's mother. I thought it provided another interesting layer not only to Jessica, but to her relationship with Trish as they now both have very complex, messed up mother issues. - I much prefer the Stan Lee cameo's in the Netflix shows as opposed to his appearances in the MCU films. His cameo in this season appeared as bus signage at the bus station. - We got to see a couple Daredevil related cameos: Foggy Nelson (Elden Henson) appeared in Jeri's office - a quick reminder that he went to work for her firm after the events of Daredevil's season 2, and Turk (Rob Morgan) continues to pop up in the various Netflix series as a small time crook, this time selling Jeri a hand gun in exchange for future law services. - We don't see any cameos from either Luke Cage (Mike Colter) or Claire Temple (Rosario Dawson) in this season. Both appeared in season 1 and have had multiple appearances across the Netflix corner of the MCU. - Westchester, NY is mentioned a couple of times towards the end of this season. Aside from being an actual location, this is also where Xavier's School for Gifted Children is located in the X-Men comics. Maybe this is a slight wink towards Disney's (Marvel's parent company) recent acquisition of 20th Century Fox (and with it, the film rights to the X-Men franchise). - Whizzer is an actual Marvel Comics character (although I had never heard of him before) that first appeared in USA Comics #1 in 1941 (as Robert Frank). Apparently he gained his powers after being given a transfusion of mongoose blood by his father Emil to combat a cobra bite. Emil is also the name of Robert Coleman's pet mongoose in the show. - Dr. Karl Malus is also based on a character from Marvel's comics, first appearing in Spider-Woman #30 from 1980. - I mentioned that I had been worried that they might try and bring Kilgrave (David Tennant) back from the dead, and I am so glad that they didn't. However, I did love the way the incorporated him into season 2 as a haunting conscience in Jessica's head. 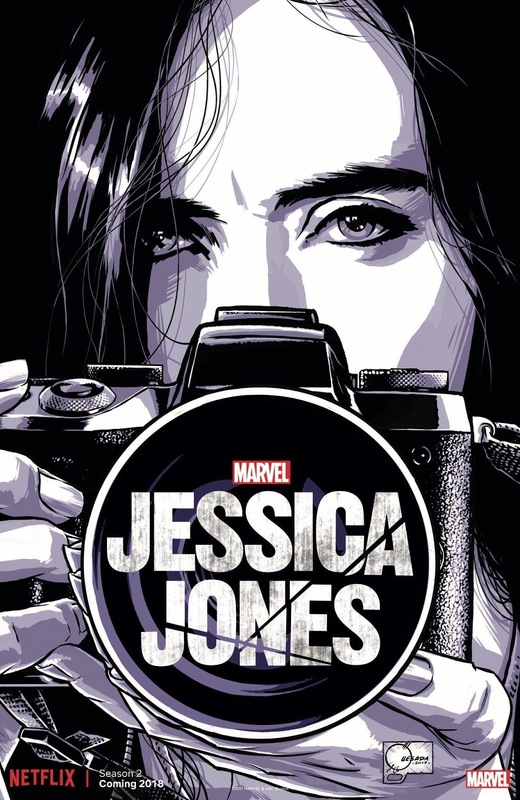 - Artist David Mack, who provided covers for two Jessica Jones-centric comic book series - Alias (2001), Jessica Jones (2015) - and helped with opening credits for the show, also produced the paintings we see in this season as Oscar's artwork. - I liked that we got a small dose of Will Simpson (Wil Traval) at the beginning of this season, although I must admit that once I saw him appear, I kind of hoped we'd get a full-on comic-faithful adaptation of Nuke, complete with flag face paint even though that would be pretty ridiculous.